USDA’s weekly inspection came in line with expectations, but the overall sentiment continues to be bearish. The improvement in weather conditions across the belts could possibly add support to the downside. USDA’s weekly inspection report came out on Monday in line with traders’ expectations. Corn had an export of 1,183k tonnes. The analysts’ range was 800k-1,200k tonnes. Soybeans had an export of 461k tonnes, just barely in range of consensus of 460k-900k tonnes. Lastly, 511k tonnes of wheat was exported, falling right in the middle of estimates of 400k-600k tonnes. The U.S. May corn futures finished Monday up 0.45% to $3.6262. U.S. May soybean futures finished up 0.38% to $8.9838, while U.S. wheat finished down 0.94% to 4.5962. 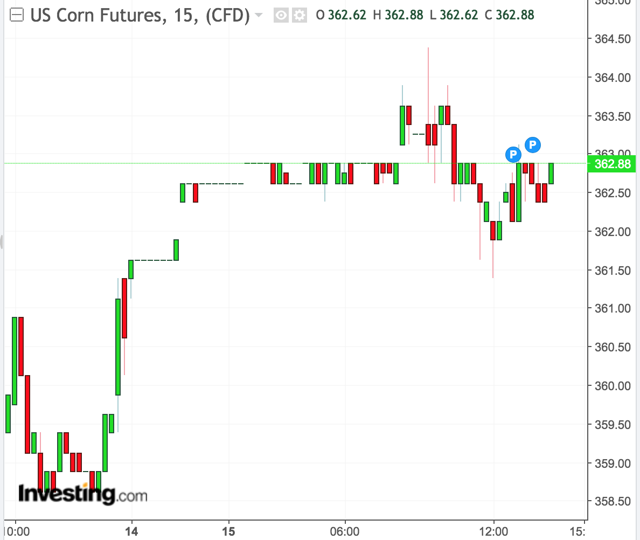 For the less volatile, unleveraged Teucrium ETF grain products, the Teucrium Corn ETF (CORN) finished up 0.46% ($0.07) to $15.42, the Teucrium Soybean Fund (SOYB) up 0.56% ($0.09) to $16.03, and the Teucrium Wheat Fund (WEAT) finished down 0.56% ($0.03) to $5.31. Figure 1 below is a price trend chart of the front-month May futures contract for corn over the past 24 hours. 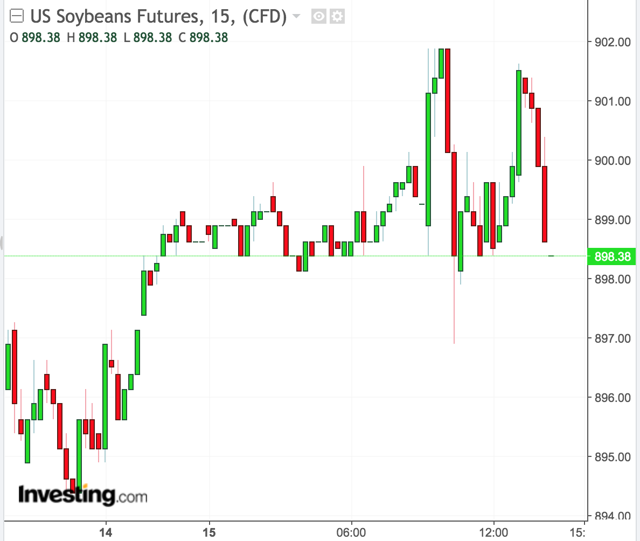 Figure 2 below is a price trend chart of the front-month May futures contract for soybeans over the past 24 hours. Figure 3 below is a price trend chart of the front-month May futures contract for wheat over the past 24 hours. 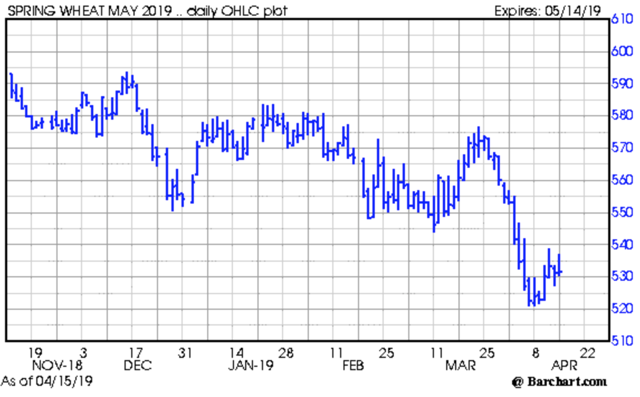 May Chicago Soft Red Winter Wheat (SRW) futures on Friday finished down 5 cents to $4.594, with May Kansas City Hard Red Winter Wheat (HRW) futures down 8 cents to $4.332, resulting in a 26-cent premium of CBOT wheat to KCBT wheat. The CBOT-KCBT spread is still bearish, but has become more bullish recently. MGEX’s Hard Red Spring Wheat (HRSW) May contract finished up $0.04 to $5.316. Figure 4 below is a price trend chart of the front-month May futures contract for spring wheat. Despite the fact that corn and soybeans were up on Monday, the upward movement in prices has been tepid. This shows that traders are still very much skeptical on the grain market and are not buying into the rally. There are just so many variables out there right now that have either a bearish sentiment ‘stay clear from’ or a ‘let’s continue to monitor developments’ type of mood. These variables include the continuation of U.S.-China trade talks, and ample domestic and global supply of crops that’s yielding less demand and more global exporting competition. There would have to be in place a major weather/climate event in the world such as a drought or flooding that would have major impacts on crops to increase the demand for crops (especially wheat). Right now there are not really such events and many areas have oversupply of old crops. Here in the U.S., we have major weather and flooding impacts that are taking place. However, we have an oversupply of old crops that’s helping to offset the weather situation. 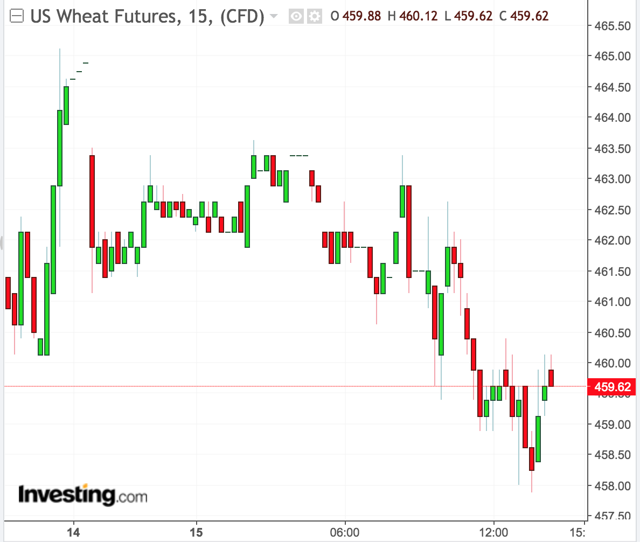 The CBOT wheat to KCBT wheat spread remains bearish, pointing out the lack of urgency for investors to buy into the market. 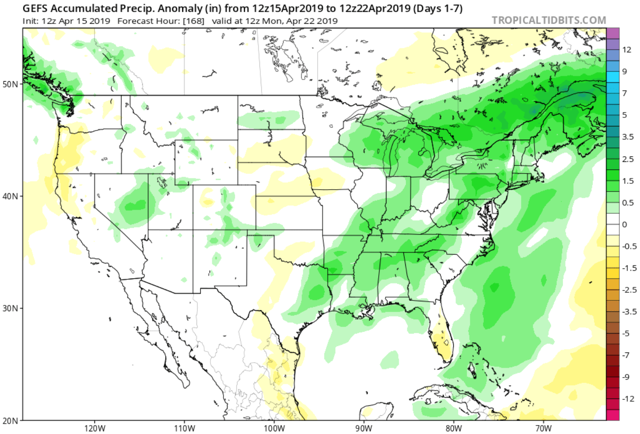 Weather over the next week and possibly beyond will show some improvements from a precipitation and temperature standpoint across much of the agriculture production centers. 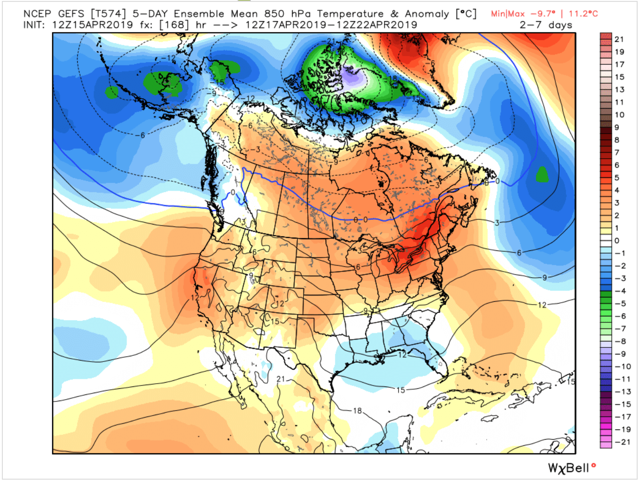 Outside of the Delta and the Upper Mississippi Valley, the next week looks drier than previous weeks. The western half of the corn/soybean belt, in fact, is looking at normal to slightly drier than normal conditions. The next storm system will eject out of the Rockies and impact the central U.S. mid- to late week. Unlike the previous two-storm systems, this one will not be as strong and will move faster. Overall, I’m expecting for farmers to have an increase in fieldwork (more open days) over the next week and next week’s crop progress report to see improvements from this week and last week. From a temperature standpoint, we will see broad warming across much of the nation over the next week. Figure 5 below is a map from the 12z GEFS depicting warmer-than-normal temperatures enveloping much of the country in the 2-7 day time frame (April 17-22). Figure 6 is a map depicting above (green) or below (yellow) average precipitation over the next 7 days. Expect continued bearish sentiment in the market with any increase in prices being lackluster or unenthused. Downside risk will continue to outweigh upside potential as long as the variables mentioned above remain constant.